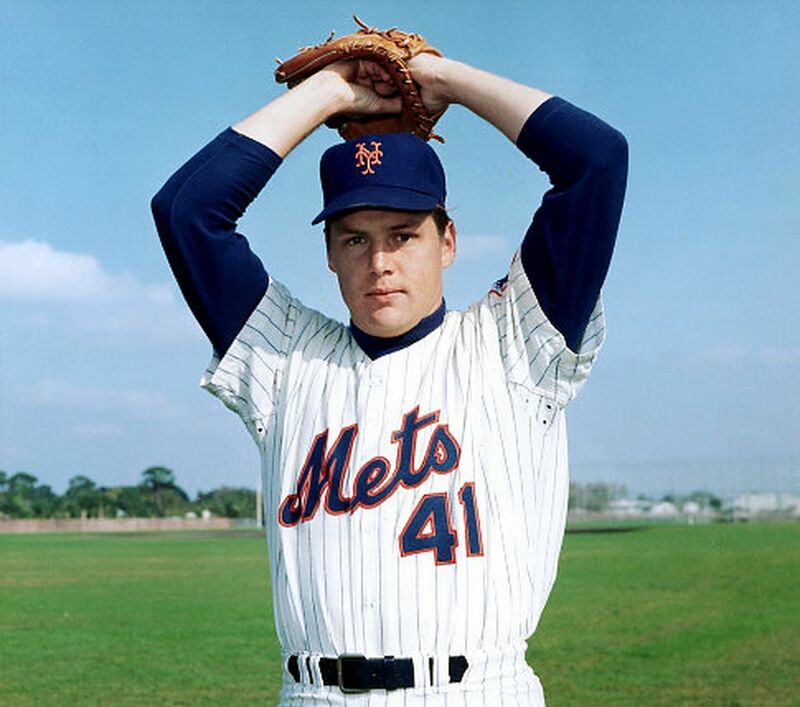 Tom Seaver was drafted by the Braves on January 29, 1966 in the secondary phase of the 1966 Major League Baseball draft, but the pick was voided. The Braves weren’t even the first team to draft Seaver. The Dodgers drafted him in the 10th round the previous June, in baseball’s first-ever amateur draft. Seaver had just completed his sophomore year at the University of Southern California then and, probably realizing he was better than a 10th round pick, he did not come to an agreement with Los Angeles. There were two drafts back then — January and June — and the Braves took him on January 29, 1966. It took close to a month for Seaver and the Braves to agree to a bonus, but they got to one on February 24, 1966, with Seaver signing a $40,000 contract. There was a slight problem, however: Seaver’s junior year season at USC was still in progress and baseball had a rule then that you could not sign a deal with a player whose season was still going on. Baseball Commissioner William “Spike” Eckert ruled that the Braves’ contract with Seaver was void. Baseball’s Commissioner from 1965-1968 had perhaps the least distinguished tenure of any baseball Commissioner ever. Maybe there were reasons to be suspicious before he was even given the job in 1965. His nickname, “Spike,” came from his football-playing days, and who hires a football guy to run baseball? Virtually his entire professional career consisted of his military service — he was an Air Force general — and military consultant. He wasn’t even considered a candidate to replace Ford Frick in 1965, but was recommended to baseball owners by the legendary general Curtis LeMay. He decisively voided Seaver’s deal with the Braves, but given that Seaver had signed a professional deal, voided or not, he was declared ineligible at USC. That meant that he couldn’t play anyplace. As Seaver said looking back at that time a few years ago, “so now to the professionals I’m an amateur and to the amateurs I’m a pro, and I’m stuck.” There were rumblings that Seaver’s dad was going to sue someone, probably Eckert. What to do? Eckert held a lottery. He invited all the other big league clubs to the party, and invited them to match the Braves’ $40,000 offer to Seaver. All teams who were willing to do so would have their names tossed into a hat. Literally. The Phillies, Indians and Mets all got involved, Eckert literally put their names into that hat and he pulled out the slip of paper with “Mets” on it. The rest — 311 wins, three Cy Young Awards and a place on the short list for “Greatest Pitcher of All Time” — was history. Eckert would soon be history too. Not because of the Seaver business, but because of other stuff. Eckert simply wasn’t popular in office. The fans were mad at him in 1968 when he didn’t cancel games following the assassinations of Martin Luther King and Robert Kennedy. More dangerously for Eckert’s job security, the owners were mad at him because he didn’t seem to have much of a plan to counter the Players Union which, by then, had Marvin Miller at the helm and was beginning to assert itself for the first time. Eckert was eventually canned by the owners with three years left on his contract. And he was replaced by Bowie Kuhn, who it could be argued was way, way worse.